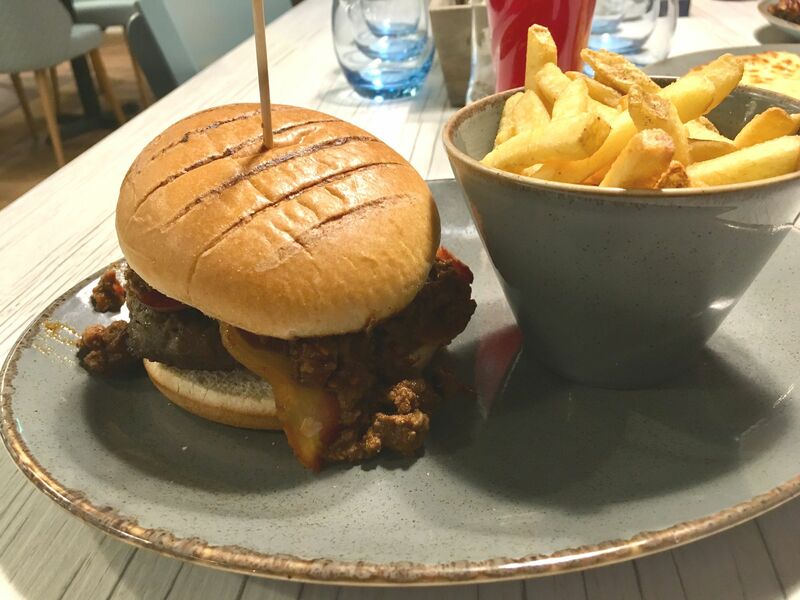 Our flame grilled burger packed with chilli beef, pepperoni, bacon & Hancock’s relish. As the sun set on a chilly Friday night in Farnborough, there was a thunderous tremor in my stomach that could be felt all the way in Aldershot. I was visiting friends getting ready a wild lads night of eliminating strangers online in Call of Duty. However, it soon became clear that if we didn’t fill our neglected tummies first, then we would surely be defeated in any encounters we faced on the battlefield. 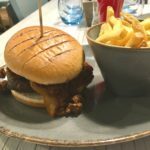 An American Diner by the name of Hancock’s had recently opened up in Farnborough town centre and it seemed like the perfect time to satisfy my burger cravings. We sat down and I perused the menu with excitement as each page revealed dozens of dishes each one sounding more delicious than the last. 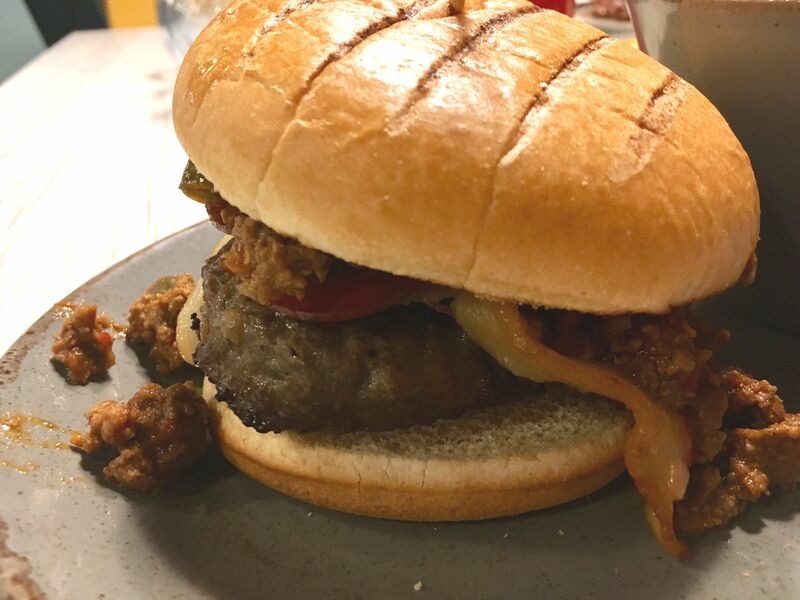 As enticing as the baby back ribs and foot long hot dogs were, I was here for one thing and one thing only, a nice juicy burger. 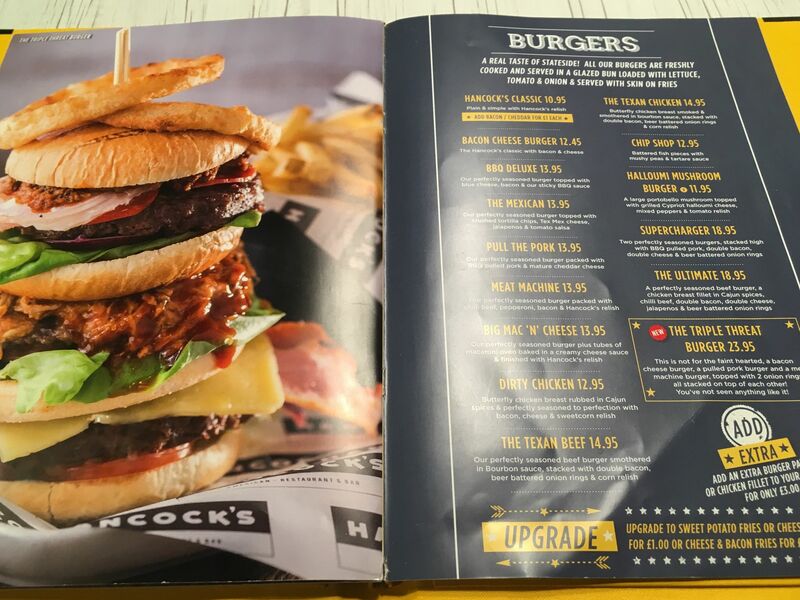 It soon dawned on me that with a menu consisting of 15 burgers with anything from pulled pork to mac and cheese as fillings, this was not going to be an easy decision. As the nation seemingly becomes obsessed with Veganuary, I feel as a lone rebel that I needed to restore some balance. I order the Meat Machine. 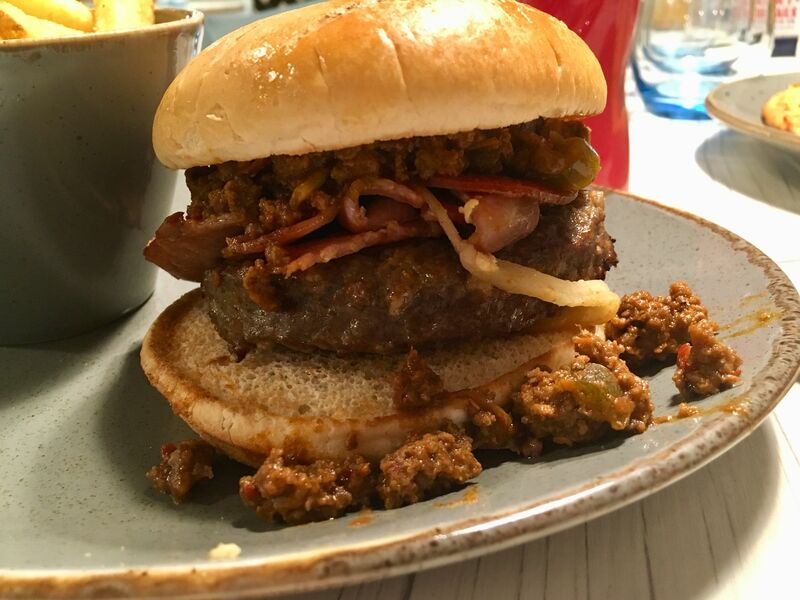 The protein-powered burger comes packed with a burger patty, bacon, pepperoni and chilli beef. It also includes lettuce, tomato and onion but I specifically requested they be removed. Nice try Veganuary, but you have got to try a little bit harder to catch this carnivore out! 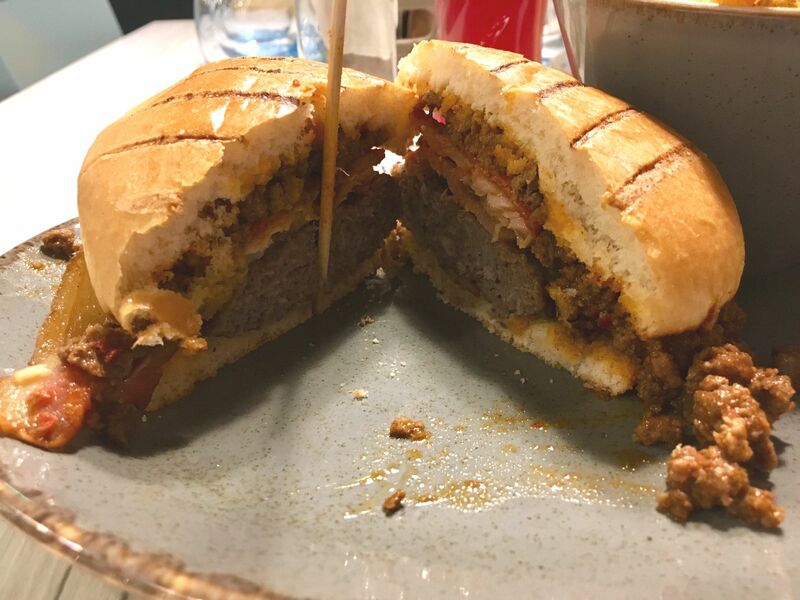 As the burger arrived to the table it was immediately evident that this was far from being the sexiest burger in the world but I feel that I’m partially responsible since my insistence of salad removal has left the burger rather colourless. This wasn’t the only problem though, as the perhaps unavoidable spillage of excess chilli beef caused an unpleasant mess on the plate. This was accompanied by the flaccid looking bacon that spilled out the burger like a teenager’s tongue going for their first kiss on prom night. I wasn’t going to let the slightly less than appealing appearance put me off though. Just because you are ugly on the outside doesn’t necessarily mean you are ugly on the inside. That’s what my mother used to tell me anyway. Thankfully the Meat Machine was actually pretty tasty. The beef burger was well seasoned and quite juicy while the always reliable bacon complimented it nicely. This comes to no surprise as no dish in the history of the world has ever been ruined by the addition of bacon. Prove me wrong comments section, prove me wrong! The subtle taste from the pepperoni was very welcome but the mild spice from it was made somewhat redundant by the medium spice from the chilli beef. Thankfully for my personal taste, the chilli beef had the ideal amount of spicy kick which didn’t leave me burning at both ends like previous chillis I’ve consumed in the past. The taste of the chilli beef was fine and did the job that it was expected to do, but it wasn’t anything to write home about. 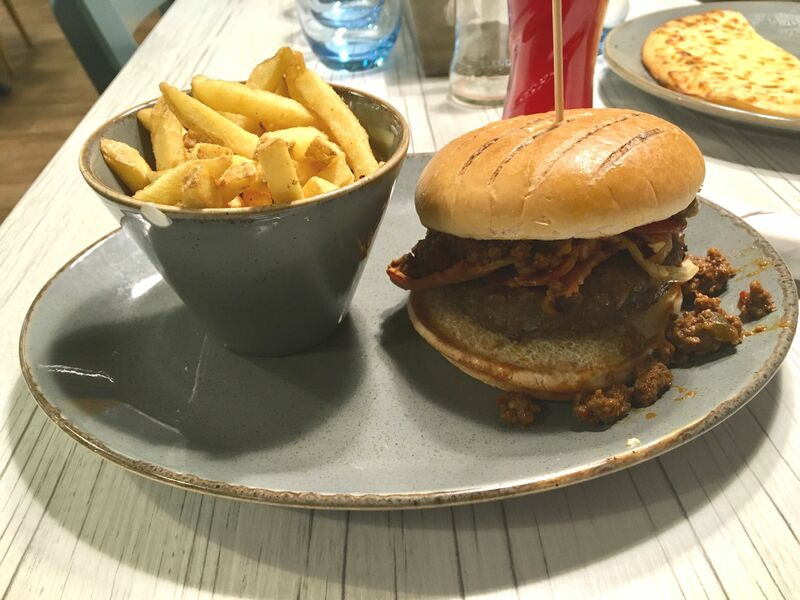 Perhaps expecting anything exceptional from a beef chilli as a burger topping in this kind of restaurant is unrealistic though. The burger came with a side of skin-on fries which were surprisingly good. I’m not usually too bothered about the fries at most places, but these were hot, fresh and cooked perfectly. The burger including fries came to £13.95 which is slightly more than I usually like paying for a burger at this standard of restaurant but considering the amount of fillings it wasn’t unreasonable. Plus it was my friends turn to pay for dinner so the price was completely irrelevant to me. Overall, the meal as a complete package was very enjoyable. The amount of meat toppings in the Meat Machine was perhaps superfluous but it still worked and had plenty of flavours. It also held together pretty well considering and I was able to eat it with my hands without having to resort to using a knife and fork, a crime I’m ashamed to say I’ve committed in the past. I don’t think I’d be in a rush to order this same burger in the future, but I would certainly order another from there again. 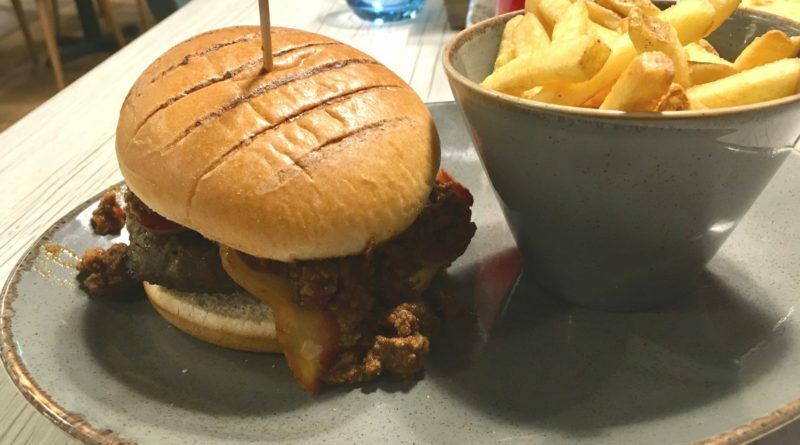 This burger seems like something Jacks mum would enjoy.. a spicy mess.